Discuss the ways in which The Great War has affect Massie Dobbs both personally and professionally, as psychologist and investigator. How do her experiences with soldiers and in combat palpably help her to solve the case at hand? What are the differences and similarities between Stephen Oliver and Billy Beale’s wife, Doreen? What distinguishes their psychological states? Many of the characters in Among the Mad grapple with mental distress—Dr. Lawrence, Professor John Gale, Detective Chief Superintendent MacFarland, Dr. Elsbeth Masters—how do their individual psychological states bring dimension and suspense to the novel as a whole? Under threat of mass terror, Stephen Oliver demands that the government immediately pay full pensions to all veterans —those who had sustained both physical and psychological injuries. At the same time, he writes in his diary “I just want to be heard.” Is he an activist or a terrorist, and to what extent do you sympathize with him. Though set in 1931, Among the Mad addresses many issues that are a part of our contemporary world—the political fall-out of wars, terrorism, a struggling economy. How does Jacqueline Winspear’s evocation of these troubles in another time shed light on turbulent days in the present? 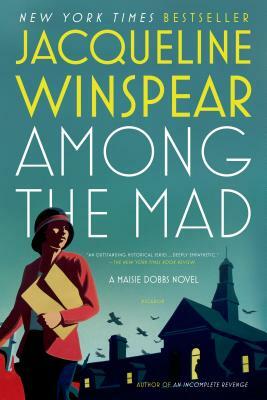 Maisie Dobbs thrives in a career largely dominated by men. But what are some of the advantages she has over MacFarland and Urquart? In what ways does she successfully deflect their antagonism? Were you surprised to find social commentary on equality threaded through the mystery? Along those same lines, do you think that Maisie’s intuitions as a detective are distinctly female, or are they coming from a different, higher place? Stratton, Darby, and MacFarland immediately suspect Mosley’s New Party and the student union activists are responsible for the letters, while Maisie takes her time to investigate the real identity of Ian Jennings and to take a closer look at Ms. Catherine Jones. How are the two approaches different? Do the other detectives miss the forest for the trees by looking at groups instead of individual motivations? Were you surprised by the brutality that Steven Oliver faced at the hands of people who were charged with healing him? How is such corruption possible? Is it ever for the greater good? Beyond acting as her loyal assistant, what role does Billy Beale really play in Maisie’s life? Does she need him on an emotional as well as professional level? Discuss Dr. Masters’ story about the lion and the gazelle on pg 136, and her rather spiritual understanding of shell shock. Do you agree with her, and if not, what metaphors would you select to illustrate that kind of suffering? Would you describe Dr. Lawrence as a tragic character? How do you feel about Maisie’s final gesture to reconcile with her at the end of the investigation?